Drivers in Metro Vancouver have a new, real-time traffic map to plan smarter and more efficient journeys. 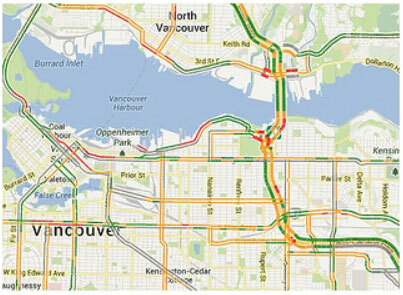 The traffic map is free to use and accessible online at the Drive BC and Translink web sites. The map colour-codes major highways and roads in the Metro Vancouver region according to traffic speeds. Green means traffic is moving well, orange means traffic is slow and red means traffic is very slow. The map also allows partner agencies to study traffic flows in Metro Vancouver. This tool will help with planning to further improve regional road infrastructure and reduce congestion. The map is based on anonymous tracking of cellphone signals using GPS technology. Movement of the cellphone signals generates the real-time traffic flow measurements, which are translated into the online map. In order to maintain privacy, any personal data from cellphones is removed before it is used in the map system. Developed by TransLink, the $1.2-million project is supported through funding from Transport Canada ($490,000), the B.C. government ($335,000) and TransLink ($375,000). The map covers Highway 1 from Whistler to Chilliwack, Highway 99 from the Peace Arch Border Crossing to Whistler, and all other numbered highways and major roadways in Metro Vancouver. DriveBC has been incorporating new features over the last two years, such as Plan Your Route, that shows the Google trip planner along with highway cameras on a chosen route. Updates are available on Twitter and Facebook and motorists can register for text messages and email to receive up-to-date DriveBC information. This entry was posted on Wednesday, August 14th, 2013 at 2:54 pm and is filed under Digital Products, Government, National News. You can follow any responses to this entry through the RSS 2.0 feed. You can leave a response, or trackback from your own site.